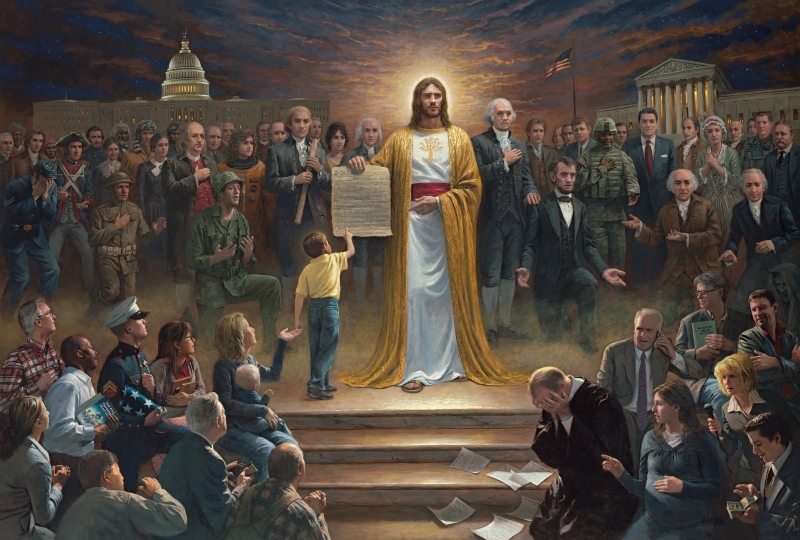 This is One Nation Under God by Jon McNaughton, who is the Luke Skywalker to Thomas Kinkade’s Darth Vader. Most of what you need to know about this masterpiece is made plain when you see that one of the “positive” characters is holding Cleon Skousen’s The Five Thousand Year Leap. On McNaugton’s website you can read his detailed explanation of all the other “symbolism.” More entertainingly, make sure you check out this parody which retains the look of McNaughton’s site while replacing all the zoom-in captions for each character. I saw this the other day and dismissed it as utter nonsense pretty quickly. Nice catch on The Five Thousand Year Leap, I hadn’t noticed that particular gem. Make sure you check out the spoof I linked. It’s got some good lines, though I think he forgot about Nathan Hale. Both links were so lol! So entertaining. Yeah, he must’ve forgotten Nathan Hale. lol.